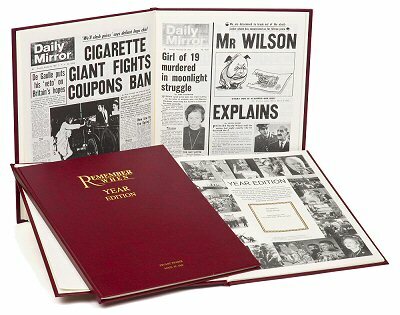 Our Remember When Year Book is more than just a commemorative year book because it also contains a complete copy of an original (British) newpaper on a day of your choice during your chosen year, making this the perfect commemmorative gift, ideal for a birthday (date of birth), anniversary or marking any event in the past. In addition to the high-quality copy of the original newspaper printed on your chosen date, this book also includes additional newspaper pages covering other major stories printed during your chosen year. What better way to bring your chosen year back to life than to read the news as reported at the time. This individually bound, hardback book holds a complete copy of an original newspaper for your selected date, plus additional newspaper reports of the major news events of the same year. This large format book measures 38 x 30cm. It opens with a front page montage surrounding your own personalised label containing the recipient’s name and greetings. Just to let you know we have received all items from our order and want you to know how happy we are with everything ... The newspaper date book, is ... an amazing present for someone who is very difficult to buy for, she will love it. All items came speedily, which is a novelty at this time of year and customer service reply to my initial email was prompt too.